Image features little Chewbacca playing with a toy Stormtrooper as a child. Sometimes, you can look at a child and catch a glimpse of that child's future. 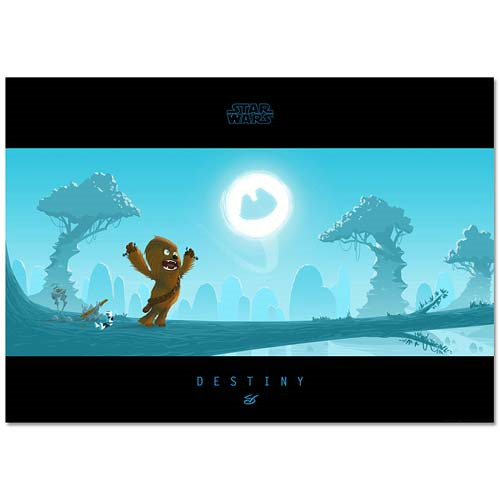 Looking at this Star Wars Little Chewie's Destiny Paper Giclee Print, who would have known that the small Wookiee boy tearing the arms off of his Stormtrooper action figure on one Kashyyyk day was going to grow up to be a smuggler and then an outstanding hero in the battles that brought down the Galactic Empire? This fantastic giclee features a wonderful and whimsical image of young Chewbacca as he plays alone with a toy Stormtrooper action figure on the large branch of a tree on Kashyyyk. This great giclee has been printed on paper and features the Star Wars logo along with the solitary yet significant word, "Destiny." Along with being a limited edition of 150 pieces, this fantastic giclee has been hand-numbered and measures 19-inches wide x 13-inches tall.